The audience play for free on their mobile phone. They play with and against others at the event. Everyone can join and the games will be shown on the big screen. Download the app. That way you're ready for the next event. Xsided is not just aimed at a few, lucky spectators. Everyone has the chance to join the games and win exciting prices. And no one needs to be afraid to perform on stage. Games and contests are the perfect way to entertain the audience before and during breaks. Xsided ensures a great complete fan experience. In the time leading up to the event, we announce the games and the sponsors in the Xsided app. Organisers are able to announce the games on their social media sites too, so fans can see all the Xsided activities at the event. The games encourage the audiences to arrive earlier so you can increase your revenue. Before the match, both the Xsided app and the big screen begin the countdown for the Xsided games. The countdown lasts between 1 to 5 minutes, so the audience has time to download the app and log in. When you log in your profile photo will appear on the big screen. 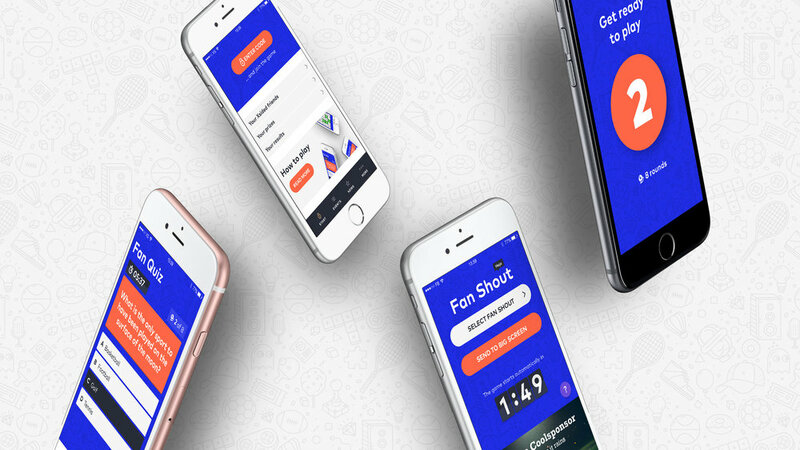 Fan shout is a popular feature, which contributes to the fun atmosphere and positive fan experience. The sponsor name and logo will also appear on the screen during the countdown. The Fan Quiz consists of 5-9 rounds with various questions and 4 different answers to each question. All questions and answers appear on the big screen, so everyone can follow the quiz. The questions can include facts about the organiser, the team, the players, or the artist, depending on the event. A Fan Quiz with 8 questions is approx. 3 minutes + countdown. Word Search is a game consisting of 5-9 rounds. The aim of the game is to find a specific word on the game board. The words are usually related to the event or the game sponsor. The games do not require any special knowledge, so everyone has the chance to win. The game board is displayed on the big screen so everyone can join in. A Word Search game with 6 rounds takes approx. 3 min. + countdown. "Guess today's attendance" is a contest, where the audience guesses the number of people, who are attending the event. All they have to do is write their answer in the Xsided app. Both the exact number of attendants, as well as the winner, will be displayed on the big screen after the game. Xsided is always developing new games, contest, and valuable features for the organisers, sponsors, and, not least, the audience. When the game is over, the winner will be announced on the big screen. The big screen show is, of course, presented with the sponsor name and logo on the screen, and the session ends in a big "Thank you for playing" from the sponsor. All participants in the games can check their results and see how they rank compared to the rest of the audience and to their Xsided friends. Comparing results with Xsided friends is a fun way to compete on knowledge and skills within a group. Results are saved in the app. This way everyone can always keep track of their results and scores. The winners receive their prizes after the games and contests are over. As an organiser, you can either distribute prizes from the side of the arena, or you can set it up as an activity on the court or stage. Organisers can share the photo of the Xsided winner on their social media sites. Showing your winners and new event entertainment will encourage fans to show up earlier for the next game. 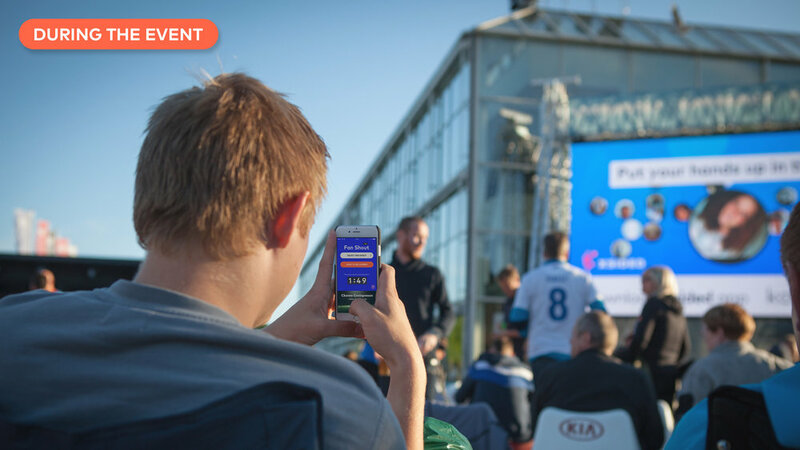 We're happy to give you a complete demonstration of Xsided and we'll find out how you can use Xsided to improve your sponsor activation and fan experience.